This butterfly drawing tutorial relies heavily on the video at the bottom of this page so don't forget to watch it either before or after you've finished the text part of this drawing lesson. I wanted to show how I would approach a realistic drawing of a butterfly so while this is in the step by step drawing section of the site I hope that you can take away so much more than just how to draw a butterfly drawing. 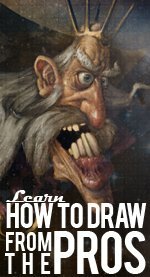 By the time you have finished the video and text in this tutorial you'll have a handful of new tools that you can use in your own realistic drawings, whatever they may be. To start - get yourself a photograph to draw from. If you squint while looking at the picture some of the basic shapes should start to emerge. With the picture I used, I was able to see the following shapes of the butterfly, a branch and 3 separate leaves coming off of the branch. Find the simple shapes in your photo and draw them lightly on the page. At this stage we are not going for perfection at all. You should only be concerned with quickly getting the drawing started. These contour lines shouldn't take you much more than a minute or two to draw. If you're taking longer than that, you're probably trying to make things overly complex. The way that I approach this butterfly drawing is no different than how I approach most of my art. I try and work from general details to specific details. What is a general detail? That's what we created in step one. Specific details are smaller details like the ones that you can see in the step two image. What I'm doing in this step is creating a 'blue-print' that I will later use when I am shading in the black and white drawing of a butterfly. Continue to add details to the other objects in your picture as you see fit. These aren't the only details that I will add in as you will see when you watch the drawing video. The main idea to take away from step two is working from general to specific to even more specific. The step three image is from the video and shows the contrast between a shaded butterfly wing, and one that only has detail lines added into it. I would suggest leaving the shading as your final step after you have added in your details. Try working in layers when you are shading. Start with a light layer by pressing very lightly on the page. Gradually increase the pressure of your pencil as you add more and more layers of shading. The harder you press, the darker the shading. In step four you can see the finished butterfly and an unfinished leaf. Keep going with the shading just as you were doing in step three. The shading should go fairly quick if you took the time to define your details from general to specific in step two. Usually I will outline areas of shade and then color them in similar to a children's coloring book. It's an extremely simple technique and if you draw your shade area lines lightly, by the time you add in shading they should blend together nicely. Use your eraser to clean up any unwanted lines around the edges of your drawing. You can also use your eraser to remove the darkness from parts that may have too much shading on them. Now that you're done with the text portion of this black and white butterfly drawing lesson, click on the video below and see all of the ideas come together as you watch the butterfly drawing being created.